Scrapsational: Weddings, School, Vacations...Oh My! I know I've been a very bad blogger lately, so thanks to those of you who have stuck around! Scrapping in the last couple of months has been basically non-existant. I've just been super busy with all kinds of other things. For starters, my daughter got married on June 23rd, so that took up alot of time. 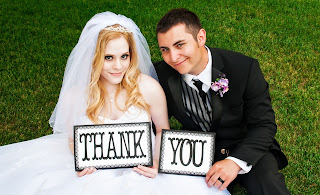 We don't have the pictures back from the photographer yet, but they did send them this one for their Thank You cards. Laya wanted me to make a simple sign that they could hold for the photo, so this is how it turned out! They were very pleased with it and I may be abit biased here, but I think they made for a stunning wedding couple! I can't wait to see the rest of the photos! Then of course, it was the end of the school year and I was extremely busy with Renee and all of her year end things going on. She has now officially ended with Elementary School and is off to Juniour High in September. My baby is growing up! Right after school finished, my dear husband and I decided that we really needed a vacation. We had not been away just the two of us for a very long time, so we headed off for a week of some much needed relaxation. Then it was off to the lake for another week. We're back now for a short while, but then heading back to the lake and it will be that way for most of the summer, so I can't promise that I'll be an any better blogger until the Fall! LOL! I did however have some time to do a quick layout for a challenge. YAY me! Bo Bunny has a white space challenge going on. I thought I'd give it a try and see what happened. I'm not really good with white space. I really like to fill up those pages. I'm not sure I succeeded, but here it is anyways! 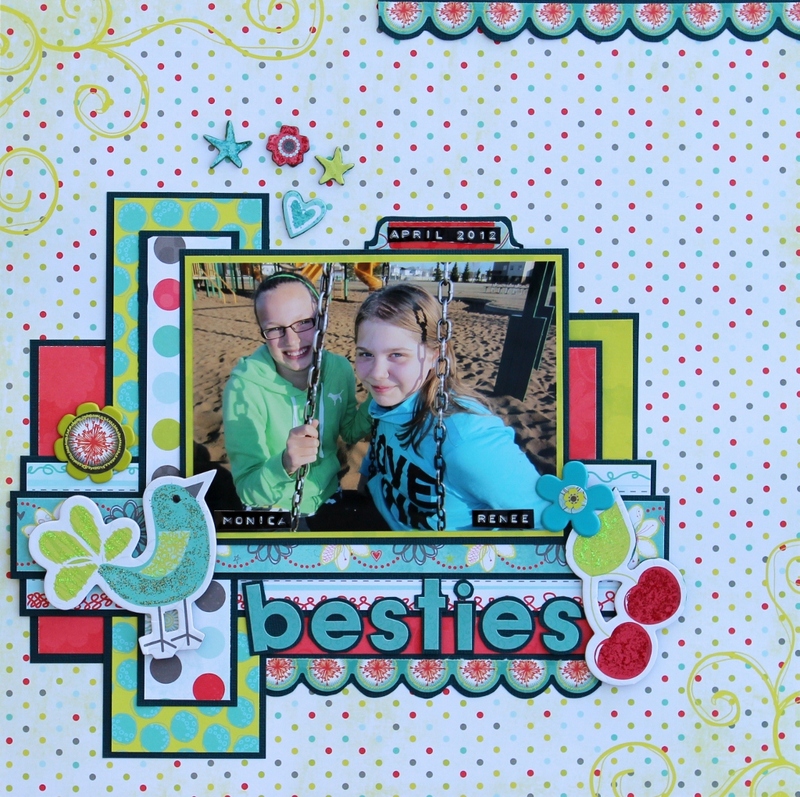 This is Renee and her best friend Monica enjoying a sunny Spring day at the Park. I'm really glad these two have found each other because they really are great together. I used a really fun line from Bo Bunny called Alora! I just love the bold, bright colors and fun patterns in this line! It was the perfect one to suit their personalities! I can't wait to see the wedding photos! This one with the Thank You is so cute and clever! Your daughter looks BEAUTIFUL, Char! Good for you to take some time off for yourself :) This Alora page is wonderful! Really sweet pics and the colours really pop! Enjoy the lake! What a great job with the thank you photo. They are a great looking couple. Congrats Renea. Glad you got a vacation! The thank you signs were such a great idea! Your daughter is very beautiful and congrats to the new couple. 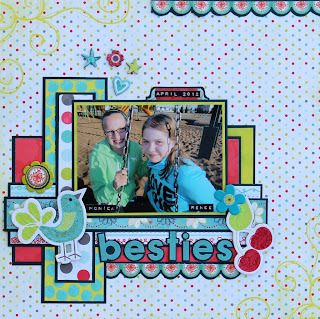 Beautiful layout Char, very colorful and love the tab on the picture. Been using lots of those myself latley!! Looks like you will have lots of scrapping to do once those wedding pictures arrive! I'm lovin the polka dot background and all your fun little details. The black backing just makes the whole layout POP!